When it comes to clothes and paperwork/mail/magazines, I can be pretty sloppy — papers get scattered and stepped on; there's a pile of clothes spilling out of my closet right now. But I cannot tolerate a dirty-looking bathroom. A gunky tub is grody, a dingy sink creeps me out, a dirty toilet is unspeakably disgusting. There were some dark, dark years when I lived in a tiny hovel slum apartment where the shower could never really get clean. But I'm in a new space, with a old-tymey but nicely renovated bathroom, and I make an effort to keep in fresh and sanitary between in-depth cleanings. In addition to myself, my dog is in the bathroom a lot because he's paper trained and that's where his Wee Wee pads are. So I'm cleaning up after both of us. Recently I'd tried using Clorox Disinfecting wipes to keep the sink, floor and toilet spotless. They're pretty good — they kill Staph, E. coli, and the viruses that cause colds and the flu. But I don't like the very strong smell and I worry about my dog inhaling it and getting it on his paws. Plus, sometimes the stuff I am cleaning up is crap (literally!) I don't want hanging around in the garbage can. I also worry about too much santizing! Am I ruining my immune system with all this disinfecting, antibacterial soap and hand sanitizer? Anyway. I still use the Clorox wipes for certain messes. But my new favorite are the Method Tub-N-Tile flushable wipes. They do not claim to be antibacterial. But since they are non-toxic, fresh-smelling, and flushable, it's easy to clean up a little yuck muck and just drop it in the bowl, on a daily (hourly?) basis. If you've got guys using your john, or one of those commodes that splashes when it flushes (shudder) these become even more useful. I'm not a big fan of cleaning — I hate doing dishes, for instance, and I loathe the very idea of handling a mop — but keeping a pack of these under the sink is so easy; wiping down the faucet/floor/toilet seat and flushing the wipe away is so quick! My bathroom is pretty much always in sparkly pristine shape. So worth it. 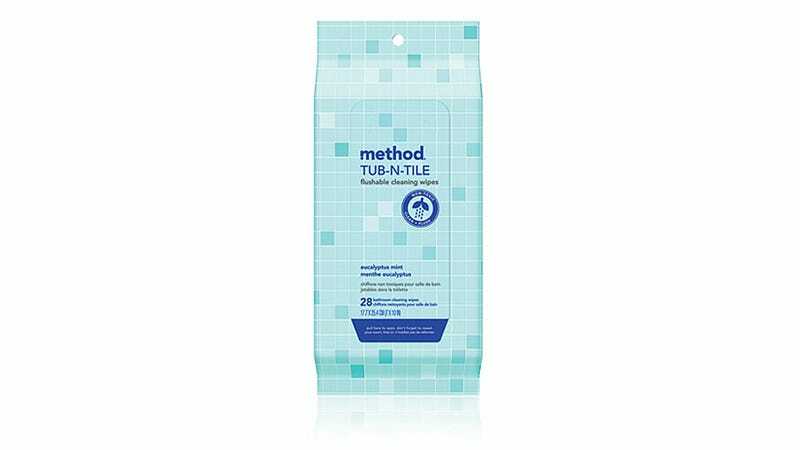 Method Tub-N-Tile Flushable Cleaning Wipes, $3.99 for 28-pack, drugstore.com.